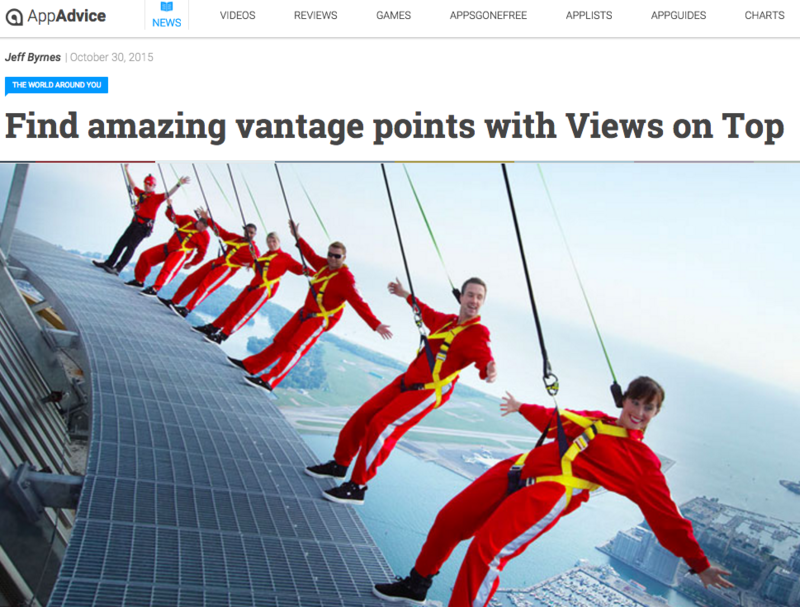 The market-leading magazine for the Australian travel industry, Travel Weekly, featuring news and analysis, product information, new technology and online development, cruising, leisure, business travel and more told its readers about Views On Top sharing the best views from the top…. Whether it’s from the tip of a mountain or a rooftop bar, a view from the top is always spectacular sight. There’s now an app to help you out next time you’re on the hunt for a new lookout. 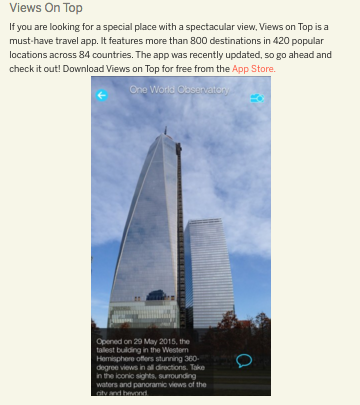 Views on Top is the new travel application which provides a definitive guide to finding great views from an assortment of places across the world such as the skyscrapers, hotels, monuments, waterfalls, roller coasters, drives, bungy jumps and much more. 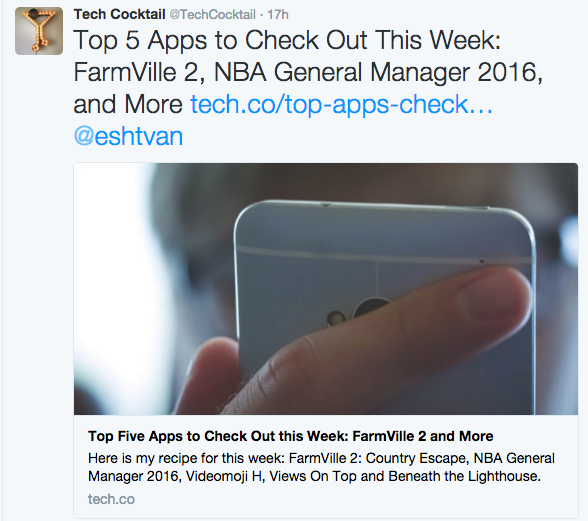 The app currently lists over 650 views across 83 countries. 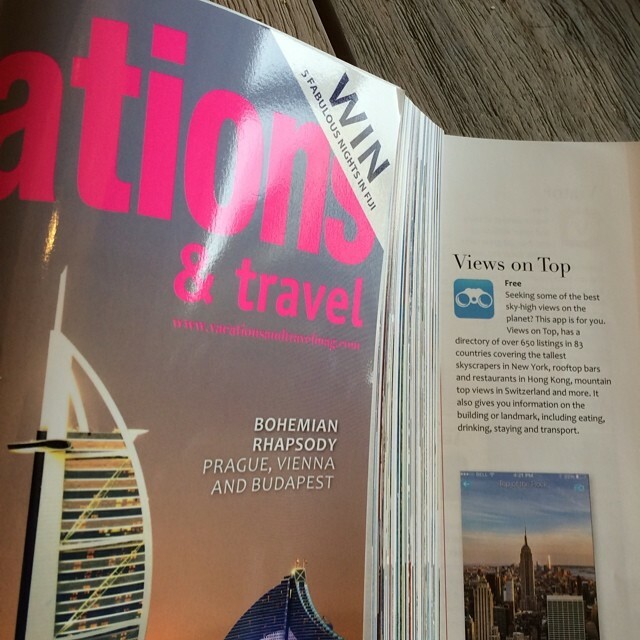 The free app was created by travel-lover Margaret Scott, who has spent the past two years researching destinations for Views on Top. “I’ve often been frustrated when visiting a new place, not knowing where to go for the best view, or where to go for a drink or a meal with a view”, said Margaret. This inspired her to create the app which shows you where to find all the best views, complete with how to get there, contact details, opening times and the ability to filter your search to your own preferences and location. Margaret also encourages everyone to share some favourite views. “If you know of a top view, scenic destination or rooftop bar that hasn’t been included – suggest it!” she said. 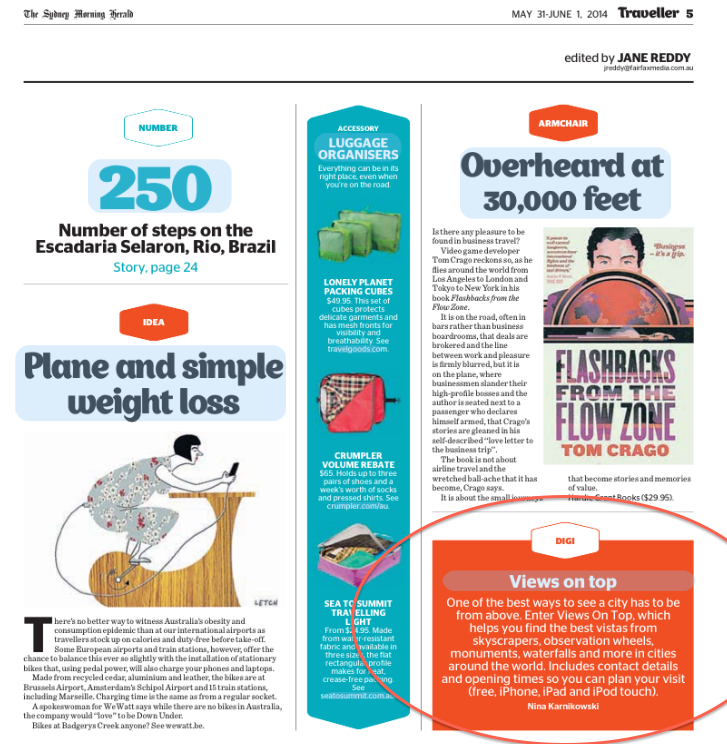 Views On Top helps people of any age simplify their choice of destination when travelling. Recently featured in Simplifying Your Life Choices, ‘the website for fun in your 50s, 60s and beyond’, offering advice for senior travellers focused on news, information, research and resources to simplify readers’ life choices, Views On Top definitely makes it easy to find the best views wherever you travel, regardless of age!